1. Preheat the oven to 200°C, gas mark 6. Roast the beetroot for 1 hour 15 minutes until soft. Rinse under cold water, peel and chop; set aside. Meanwhile, heat the oil in a large pan and cook the onions, caraway and cumin for 10-12 minutes. 2. Add the beetroot, peeled, cored and chopped apples, vegetable stock and star anise. Bring to the boil and simmer for 10 minutes. 3. Discard the star anise and purée the soup in a blender. Return to the pan, season and reheat. Combine the soured cream, horseradish and lemon juice in a bowl. 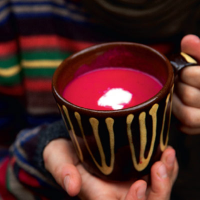 Serve the soup in mugs, topping each with a spoonful of the cream.